I am very happy to report that as of last night’s weigh-in before class I have dropped another 4.4 lbs for the week. That is a total of 20.2 lbs of my former self since I began the HMR program. In order to draw a comparison for this loss I searched the Internet for a picture of 20 lbs of fat. I was looking for fat because fat is basically what I am losing because I am also working out and exercising. In my search I have found the image attached to this article. The image shows a comparison of 5 lbs. of fat to the weight of a regular sized brick. 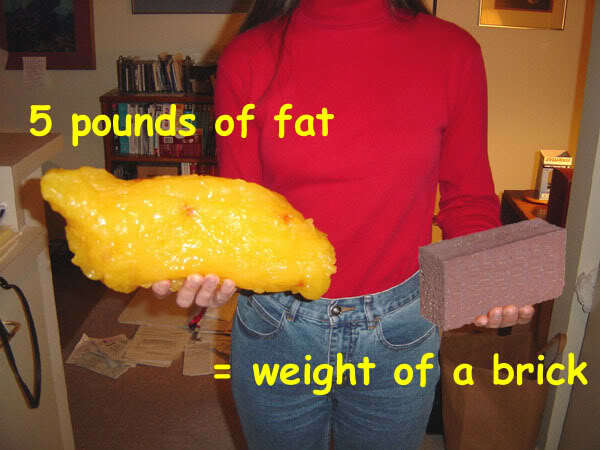 Using this comparison I can conclude that I have lost four bricks worth of weight. I think the image of the fat is a little more impressive. It is much larger in size. By exercising consistently I am hopeful to replace the fat I am losing with muscle, which will burn calories more effectively. Earlier this week I had my annual physical and my doctor has taken me off of one of the two hypertension medications I’m taking. He also told me that by achieving my goal of under 200 lbs, I should be able to completely come off of all the medication. Praise the Lord & Woo Hoo! !